Patricia Carol O’Connell (nee Freitag) of Jackson, Wisconsin, passed away peacefully on Thursday, March 28. Patty was born in Milwaukee, Wisconsin, on March 30, 1952, to Lawrence and the late Lucille Freitag. She married her soulmate, Joseph O’Connell, on May 26, 1973. They were married 46 years. Family was always the center and heart of Patty’s life. Her children and grandchildren were her pride and joy. Patty cherished time with her parents and was a dedicated caregiver. 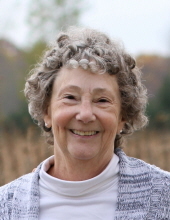 Patty led a life devoted to Christ and was active in Trinity Lutheran Church of West Bend. She will forever be remembered for her kindness and service to others. She is survived by her husband Joseph, children; Ethan (Julie) O’Connell of Casper, Wyoming, Erin O’Connell of De Pere, Wisconsin, Megan O’Connell of Montevideo, Uruguay, and Maureen (Eduardo) O’Connell of Madrid, Spain, grandchildren; Elias, Lucca, and Amaya del Campo O’Connell, Lucille O’Connell, her father; Lawrence Freitag of West Bend, sisters; Susan Peelman and Sharon Greany; Dog, Stormy. She is preceded in death by her mother Lucille Freitag and sister Nancy Freitag. She is further survived by nieces, cousins, and many other relatives and friends. Funeral service will be held Monday April 1, 11:30 AM at Trinity Lutheran Church 140 N. 7th Ave. West Bend. Visitation will be at the church on Monday from 9:30 - 11:15 AM. Interment will be at Lincoln Memorial Park, Milwaukee. Flowers or donations to the Pancreatic Cancer Action Network are appreciated. To send flowers or a remembrance gift to the family of Patricia C. O'Connell, please visit our Tribute Store. "Email Address" would like to share the life celebration of Patricia C. O'Connell. Click on the "link" to go to share a favorite memory or leave a condolence message for the family.